Sitting down for lunch in the middle of the whiteout. In this picture visibility is relatively good compared to what we experienced. It is almost as if the dogs have grown wings! We left Whale Cove late Tuesday afternoon, after spending some more time at the Whale Cove elementary school (www.inuglak.allmyfiles.com). We wanted to stick around for the exciting Lotus Sametime chat session that same morning (THANKS for all the great questions!). After just a few hours of running, we were left with a little more than 40 miles to Rankin Inlet. Friday morning was clear, beautiful, and calm so we decided to attempt a BIG push. We knew it was a long shot - but we made it! It was true team work. Paul’s team with Freja and Cola in the lead was out in front keeping an excellent pace the first 7 hours. 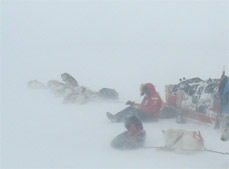 Then Mille’s team with Aksel in lead took over pushing, the last 3 difficult hours into the sunset and Rankin Inlet. They had lots of "rabbits,” though - but not literally. Loose dog teams, snow mobiles, air planes, and even the smell of town enticed the team to pick up speed. Aksel has acquired a strong desire for pulling into town. When a village is near he is always “on” and alert no matter what the time. As soon as we near a town, there is no stopping him. The rest of the team follows eagerly along. "Never to be tired" Timber always shines even though the pups in his team Khan, Disko, and Sable were definitely beginning to wonder if the day would ever end. Rankin Inlet is a large community with almost 3000 people. Pulling into town, we were a little worried where we would be able to "park.” Luckily, John Tatty and John Hickes came out on the ice when they saw us in the distance and led us right into the bay. There were sled dogs all over - staked out on the ice and even up in the cliffs, but Aksel did an excellent job and stayed on the trail! It turned out we were able to park right in front of John Hickes’ house. He very kindly asked us to stay. John is a great man. He has been the mayor of Rankin Inlet and is currently the president of 9 different businesses. One of his jobs is as the Assistant Deputy Minister of the Nunavut Department of Sustainable Development which is a government office that manages different agencies: fisheries and oceans, community economic development, wildlife resources and natural resources. Officers are all represented in each community. John is also the president of Nunavut Development Corporation. This organization works with communities to develop business opportunities utilizing the area’s natural resources. For example, the corporation is opening a fishing plant in Whale Cove this summer. It will buy and process the extra fish that the locals catch. The plant is expected to offer six or seven jobs, and in turn, support 10 to 15 harvesters (those fishing). In the little community of Whale Cove with about 250 people, these numbers mean a lot! 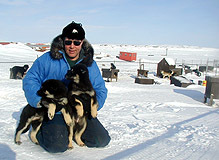 Our host and passionate dog lover John Hickes, with a couple of young pups inside his dog kennel. John has seen and experienced lots in his life and has many interesting stories - both good and sad. He likes to share his knowledge, but becomes especially excited when we talk about dogs! John and his girlfriend, Dyan, own 42 dogs. Most of them are FAST racing dogs, running up to 20 miles an hour! Right now, Dyan is in Yellowknife training for the World Championship there. They also have 6 "huskies" as they call them up here. That's dogs like ours: big, very strong, and slow. They are also known as Eskie, Usky, and the official title, "Canadian Inuit Dog." Not many people own these types of dogs here. They are actually considered a threatened species. ”Qimmiq" (means dog) as they are called in Inuktitut have been a vital companion and work mate for the Inuit when living on the land. Dogs and humans have had a long history for over thousands of years. Remains of dogs have been found in archeological sites dating back 4000 years. 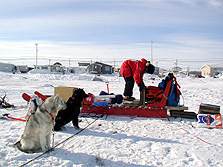 Back then, the dogs were probably used for hunting, and not pulling, since there are no signs of runners, sleds, or any other mushing equipment at the sites. The fossil records do indicate that dogs were used to pull around 1000 years ago, in the beginning of what is called the Thule period. Using dog power was a major technology shift for the Inuit. This allowed them to travel faster, farther, and with heavier loads. In the beginning of the 20th century, it is believed that there were more than 20,000 dogs in the Canadian Arctic, today there are very few. Many are actually considered a "threatened” species. Because of this and the fact that huskies are an important part of Canadian history, they were named "the official animal of Nunavut." In the northern most regions, there are still quite a few; however, most of the sled dogs we have seen are the "racing type" husky. In every community, people tell us that they would like to see the "real huskies,” as they call our dogs, return. We often try to send some of our pups north and help restore a unique aspect of Inuit and Canadian heritage. Many Inuit would like them back because they can use this type of dog to help in subsistence hunting, sport hunting, tour guiding, and of course, for fun! The smaller racing dogs have a hard time with the harsh weather up here. The big dogs are made for this! The reason Spank can be laying on his back, stretching out, and enjoying life at -40 below is because of his double coat. On the outside, a heavy coat of long oily guard hairs sheds water and snow and protects the inner coat - a thick, soft lightweight fleece of fine wool. A Muskox has long guard hairs and a thick inner coat just like Spank! Do you think they’re related? Vince, 7 years old, with his team of dogs...Vince is John's nephew. He likes to play hockey, run sleddogs (he is training for racing) and to play soccer! His favorite food is caribou and he likes to read books about Super Shamu - a guy from Baker Lake who saves people - kind of like Superman! Oh, he also likes Pokemon cards. Vincent's future plan is to win the Arctic Winter Games Dogsledding Competition as well as be able to go as fast as his grandfather with a dogteam!! Musk oxen (Ovibos moschatus) are considered the most "arctic" of the northern land mammals. Whereas a polar bear resembles other bears, there is really no other animal like a muskox. With impressive long, curved horns, stout body, and woolly coat, muskox are the only survivor of a group of "ice-age" oxen species from about 18,000 years ago. They are the only High Arctic mammals that seek no shelter of any kind during winter blizzards. Their thick coats (which is dark brown except for a pale cream-colored saddle) keep them warm enough so... they just stand there! Their outer coat of long guard hairs almost reach the ground and even camouflage most of their white legs underneath. Both males and females have horns which are mainly used as defense against wolves - their only natural predator. When wolves threaten a herd, the adult musk oxen arrange themselves in a circle with their young in the middle or in a line with the young behind them. The wolves are then faced with an unbroken row of lowered heads and sharp horns. So, unless they are very quick and get a calf before the adult musk oxen are all lined up, the wolves simply just have to give up! We saw this ourselves a little to closely some years back when Aksel and Choko were pups. We were traveling through the Richardson Mountains in the Northwest Territories and had two teams of dogs and three, four month old puppies. Two of them, Aksel and Choko, were running loose alongside the sleds, having lots of fun exploring as we sledded along. Mille saw some big brown lumps way out on the horizon, and before she even had time to think, the pups had charged ahead. She steered her team towards the animals and realized that the lumps were actually musk oxen. Seeing the approaching dog teams, the musk oxen went quickly into their formation. The pups who didn’t know much better just ran and yapped in between the legs of the musk oxen. We decided it would be safer to turn the teams the opposite way quick and hope the pups would realize we were leaving and follow. They did and we were very relieved. Hopefully, both Aksel and Choko will remember to be careful now, as we could very well meet some musk oxen in the next week!!! Last night, we decided to change our route. John Tatty came over for tea and to show us the best route from here to Chesterfield Inlet, the next village before heading due west to Baker Lake - about 320 miles from here. He told us frankly, "If I were you, I would just head with the drifts (remember: northwest) straight to Baker Lake.” We pulled out some more maps and he showed us an old route that is still used and goes exactly where we would like to go. This route is only 140 miles to Baker Lake and we could gain back some of our lost “blizzard” time! We will be able to follow a snowmobile trail for a little while, but most of the route will be marked with Inukshuks. This means "Good-bye" to Hudson Bay and “Hello” to traveling inland over rolling land while following lakes and waterways. We should see lots of animals, too. John said there are lots of caribou, fox, wolves, and maybe even musk oxen and wolverine. We'll let you know! Actually, there will be more animals around us than what we realize. Not very animals have it "as easy" as the Musk oxen. To survive the strong winds, blizzards, and freezing cold, land mammals in the arctic have had to adapt. Most can not migrate south for the winter. So, those that stay have two options: hibernate or tolerate. Marmots and ground squirrels hibernate which means they basically build a warm nest and sleep through the cold season, half waking up every two weeks or so, to shiver a little bit creating some body heat, and go back to sleep. Others, like voles and lemmings, are too small to hibernate, they would freeze if they stopped moving for an extended period of time. Therefore, they live in the subnivean air space, a layer of air between the land and the snow. Insulated beneath a layer of snow, they dig tunnel systems where they forage for food protected from the elements and predators. Sometimes they do come above ground though, but they better watch out.. for the arctic fox who are exceptionally well adapted to arctic life. Arctic fox have a magnificently thick and fluffy winter coat and even have furry soles on their feet. They have a much less "foxy" face than their cousins the red fox. Their muzzle, legs, and tail are considerably shorter as are their rounder and shorter ears. These characteristics protect the arctic fox against the cold because less surface area means less that can get cold. In other words, short limbs and a roundish body are great for cold weather. Another example of this arctic adaptation is the snow hare’s short ears and tiny legs. A desert hare has very long ears and legs because its main concern is not being cold, rather it is overheating. The large surface area (big ears) act as radiators and allow the hare to lose heat quickly. What are the animals like in your area? Is the climate reflected in the dominating body shape? Visit the "Big Freeze" collaboration zone for more information on "how to survive winter" and to share thoughts with other students. Though lemmings without a doubt are the favorite food of an Arctic fox, they are well adapted to eat anything and everything from berries to insects and bird eggs to a fat piece of seal. They can often be seen closely following polar bears and scavenging their kills. The saying is that if you see lots of foxes, polar bears will be pretty close by. That is one advantage arctic meat (carnivores) eating animals have over carnivores in the warmer climate south. Most of the year the temperature here is low enough to ensure that the meat won’t spoil. The meat of a kill quickly freezes, so if for any reason a carnivore leaves some leftovers behind, it won't be wasted because it will be in good condition until a scavenger comes. That's probably why all Arctic carnivores will eat leftovers when they find them; they don't limit themselves to freshly killed prey. When hunger and finding enough to eat in order to stay warm is your number one concern in the winter, you can not afford to be a finicky eater. It is much tougher to be a herbivore, a plant eater, in the arctic. The tundra only offers fresh greenery during a very short period out of the year. The rest of the year it is very hard to find forage. The solution is pretty strange. Scientists have found that animals like caribou and musk oxen actually "shrink” themselves in the wintertime. The animals lose a considerable amount of weight during winter, but apparently not because of starvation. The weight loss is normal and does them no harm; it is adaptation that allows them to survive the food shortage during winter. By losing weight, they reduce their need for food! Put another way, when the forage becomes insufficient for heavy animals, they "shrink" to match the food supply. It is believed that the animals put on weight in the summertime, not in preparation for winter food shortages, but to supply them with the large amount of energy needed for reproduction! Another fact to consider is that winter forage is low in protein. This actually benefits the animals since a low protein diet reduces the amount of water an animal excretes. This reduces the animal's need for water, which in turn, reduces the amount of energy it must waste melting snow and ice, the only source for water in winter. Pretty interesting, eh! Actually a real expert on this topic "nutrition and diet" will be available for you and your questions at the Sametime Chat in the "Arctic Engine" collaboration zone next week!!! Mille is trying to make it all fit on the sled. We picked up: 8 boxes of Science Diet Endurance dog food, 4 bags of Active dry dogwood and 6 large boxes of human food, most of it being Hilmar cheese and butter. That all adds up to 1080 lbs.